Brightly colored feathers draw young children to watch parrots in pet stores. 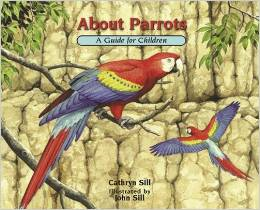 This book for beginning readers will draw them in much the same way with its beautiful, full color illustrations. Various types of parrots are shown in diverse habitats. Each plate clearly shows the information stated on the text pages right down to the details like putting food in their mouths with their feet. Children and adults alike will enjoy studying the pictures. The large, bold black font makes the one sentence of text at a time, non-threatening for young readers. Also on each page in much smaller print is the number and name of the illustration plate. For more detailed information, a higher functioning reader can turn to the back of the book and find more in-depth information. This section offers background information for teachers, librarians and parents to use when sharing this book with children. There is also a list of books for further reading and some current web-sites for use in further research. Second grade readers as well as independent first grade readers will be able to enjoy this book on their own. This volume is a new addition to the About…Series from the Sills. Each of these books could be used to fulfill core curriculum standards in the area of science and nature. They would give children enough information and interest in the subject to continue to study animals. Extras: Afterword contains detailed explanations of each illustration plate that are on a much higher reading level. This section would be helpful for research projects.